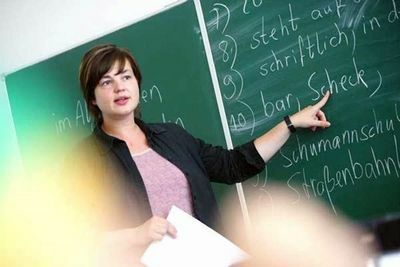 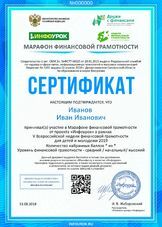 Инфоурок › Иностранные языки ›Презентации›Презентация по английскому языку "Новый год в разных странах"
New Year's is one of the oldest celebrated holidays. 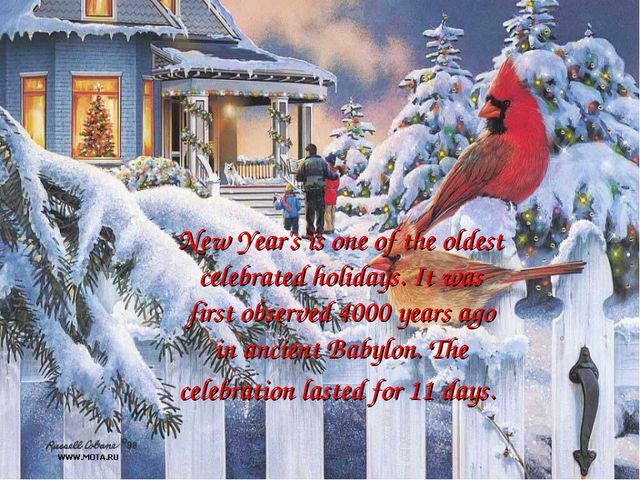 It was first observed 4000 years ago in ancient Babylon. The celebration lasted for 11 days. 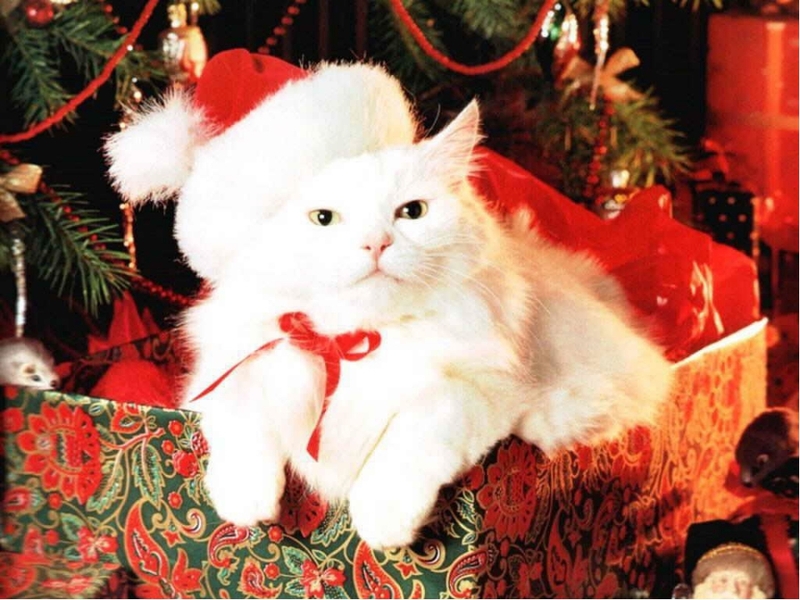 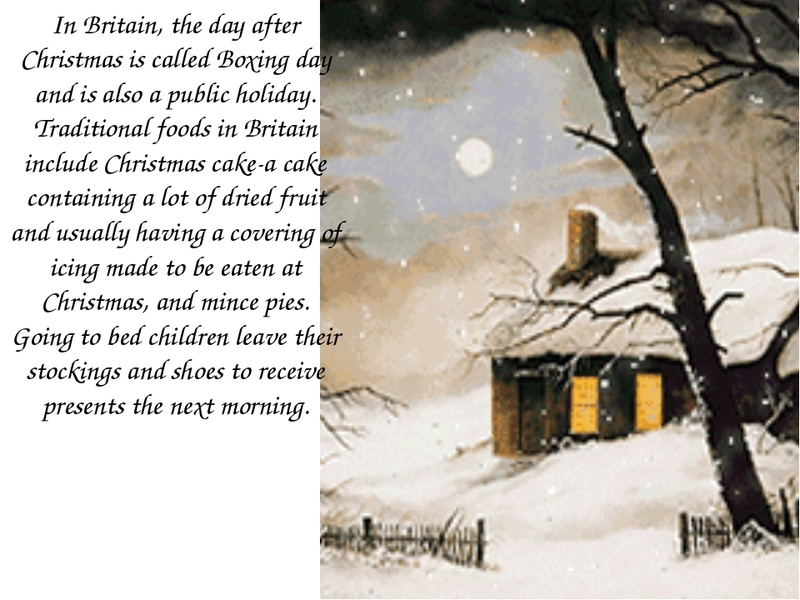 In Britain, the day after Christmas is called Boxing day and is also a public holiday. Traditional foods in Britain include Christmas cake-a cake containing a lot of dried fruit and usually having a covering of icing made to be eaten at Christmas, and mince pies. Going to bed children leave their stockings and shoes to receive presents the next morning. 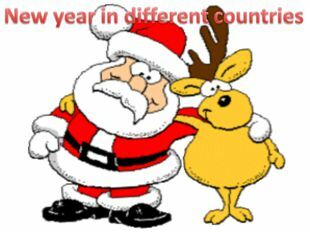 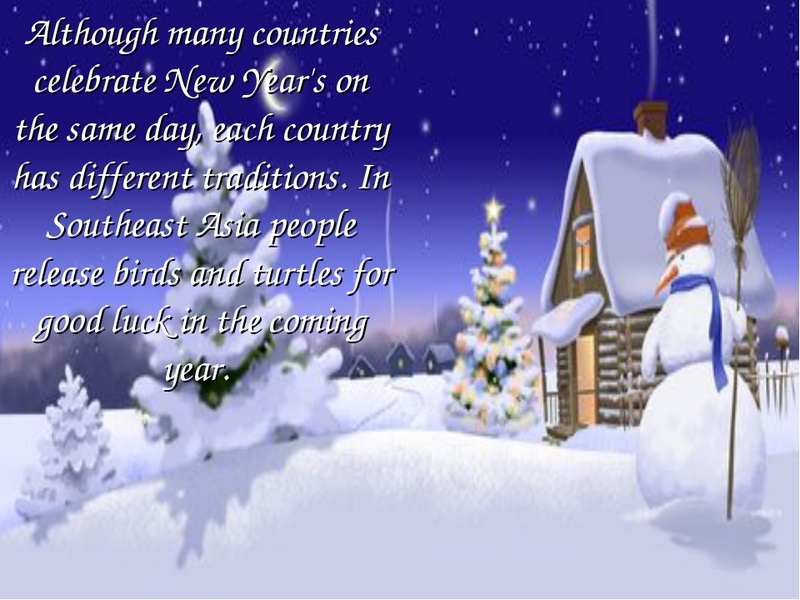 Although many countries celebrate New Year's on the same day, each country has different traditions. In Southeast Asia people release birds and turtles for good luck in the coming year. 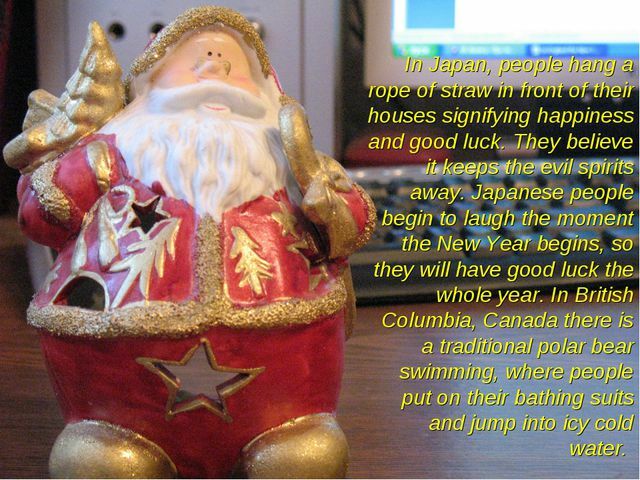 In Japan, people hang a rope of straw in front of their houses signifying happiness and good luck. They believe it keeps the evil spirits away. Japanese people begin to laugh the moment the New Year begins, so they will have good luck the whole year. 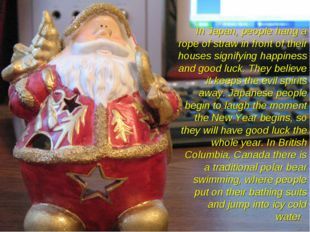 In British Columbia, Canada there is a traditional polar bear swimming, where people put on their bathing suits and jump into icy cold water. 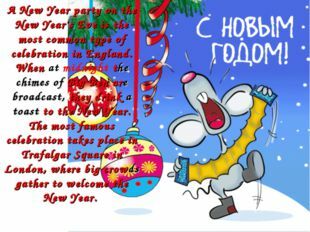 A New Year party on the New Year's Eve is the most common type of celebration in England. When at midnight the chimes of Big Ben are broadcast, they drink a toast to the New Year. The most famous celebration takes place in Trafalgar Square in London, where big crowds gather to welcome the New Year. Some people in Scotland go outside and meet New year on squares singing songs or dancing. The first man coming to you after the New year Eve may bring you luck, especially if he comes with a piece of bread and coal. 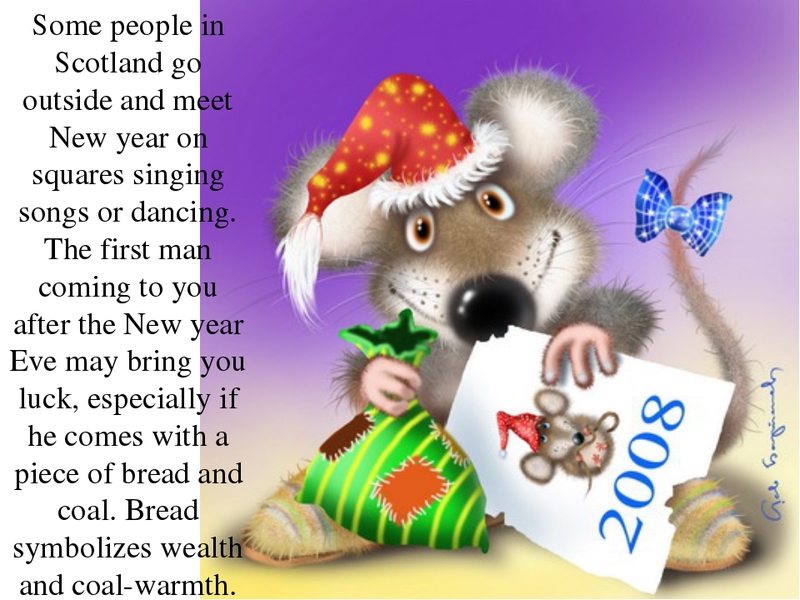 Bread symbolizes wealth and coal-warmth. 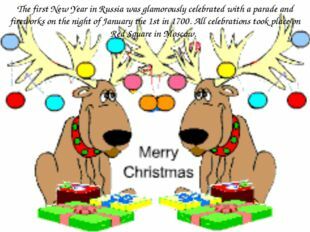 The first New Year in Russia was glamorously celebrated with a parade and fireworks on the night of January the 1st in 1700. 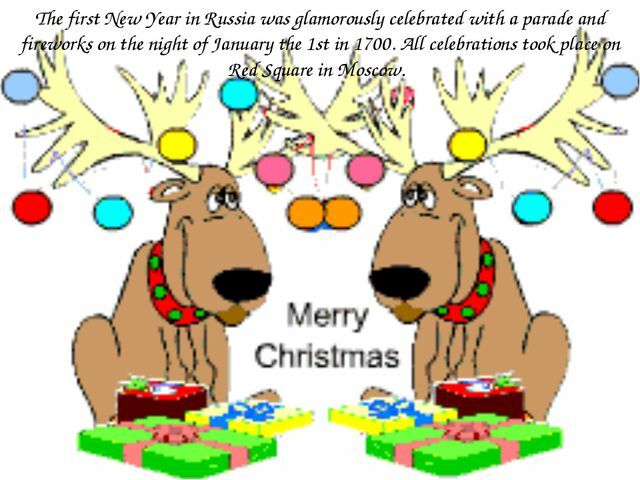 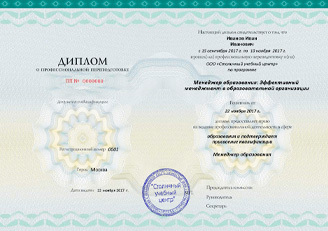 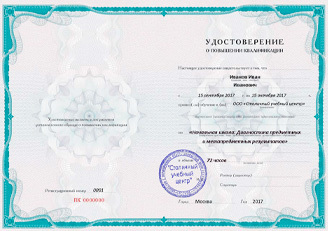 All celebrations took place on Red Square in Moscow. 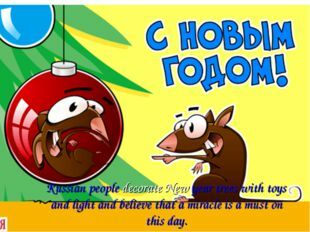 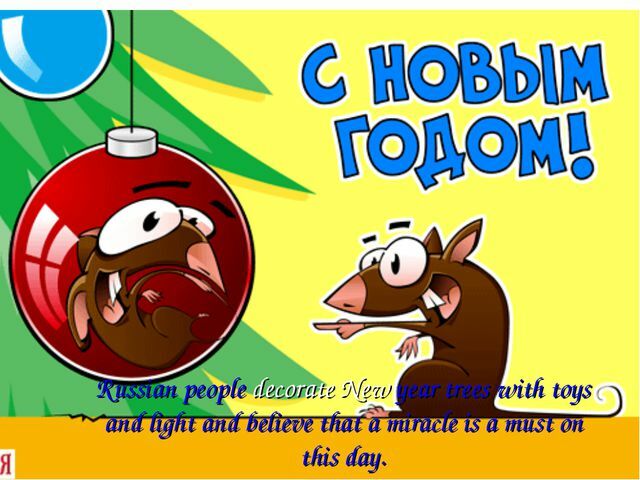 Russian people decorate New year trees with toys and light and believe that a miracle is a must on this day. The song, "Auld Lang Syne," is traditionally sung at the stroke of midnight in almost every English-speaking country in the world. 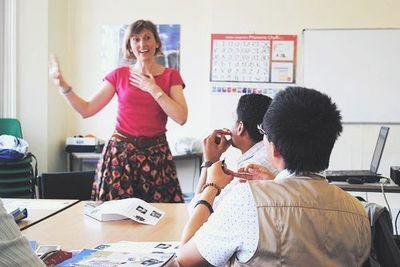 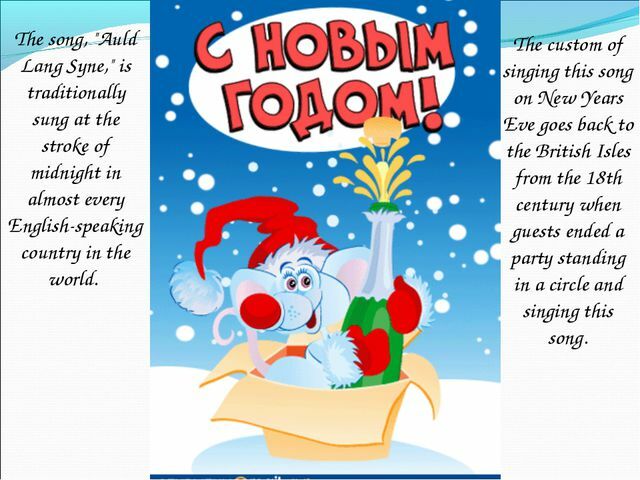 The custom of singing this song on New Years Eve goes back to the British Isles from the 18th century when guests ended a party standing in a circle and singing this song. 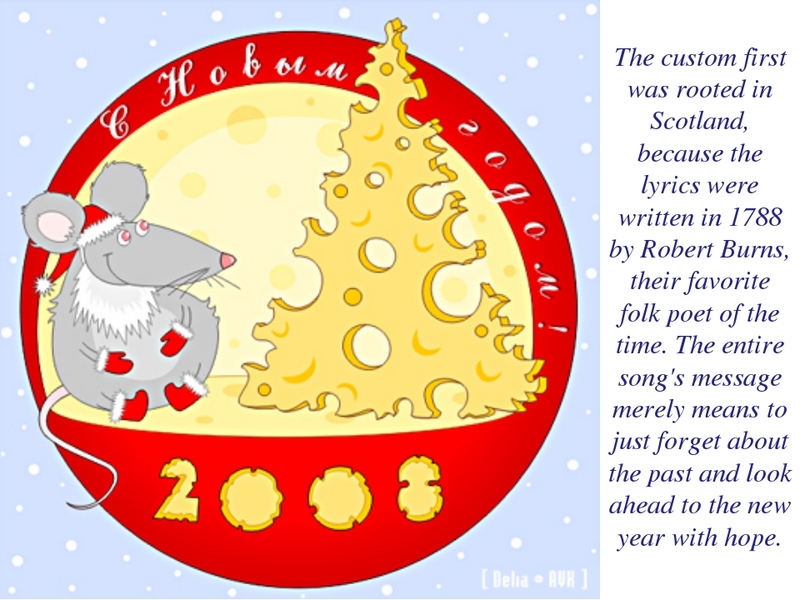 The custom first was rooted in Scotland, because the lyrics were written in 1788 by Robert Burns, their favorite folk poet of the time. The entire song's message merely means to just forget about the past and look ahead to the new year with hope.